Get on the list to receive ‘good as new’ PC pricing – new models each week. If you don’t ask, how will you know? We’ve got ‘good as new’ computers just waiting to be scooped up by schools. With budgets tight and demands high, you’ve always come up with some creative ways to help us get quality equipment at a price that allows us to get the quantities our environment requires. We were quite pleased with the initial quote we received. The delivery of the laptops was quick and without hassle. Most importantly, we have been extremely pleased with the quality of the laptops and the mobile cart. Your straight forward approach to the realities of a supply chain, and your knowledge of the products you have is better than most of my other national vendors. Products are always on time, correct, and in great shape. Thank you so much for always having our needs as your top priority. We get our refurbished computers from Compugen and they are pristine. They are palletized, individually wrapped and sealed in a really professional shipment. My bench tech opened one up recently and he told me: this thing is absolutely spotless, inside and out, even the power supply, the pots—everything is pristine. Even the outside of the unit was almost brand new. Part of it is price. Part of it is timing. But mostly, for me, it’s about relationship. I’ve had a relationship with the sales person I work with for probably ten or twelve years. And that’s the important thing, honestly. Because he knows that I’m a straight up guy. I’m not going to quibble about something insignificant. But he also knows that if I need something done, if I have a complaint or I have an issue, then it’s a legit one, and he’s going to take care of me. That’s really important. I am writing this letter to express my appreciation for the outstanding customer service you provided during our last purchase. You and your company are knowledgeable about the products and service and were extremely helpful. Your pricing, shipping and delivery were as promised, and right on budget. The laptops that we received were exactly what we needed, and all the units worked beautifully and were in great condition upon arrival. We are very satisfied with our purchase. Thank you for your knowledge and timely efficient service in putting this order together. Our school district regularly purchases new technology to help our teaching staff and students achieve a more effective learning environment, and we rely heavily on our vendors to identify the most cost effective solutions. 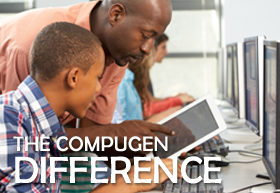 Compugen has consistently offered the most cost effective options for us, and your help with both our recent order of laptops and desktop computers and the processing of our replacement units is greatly appreciated. Thank you for your outstanding customer service and support. I’ve had the privilege of working with David Carlson on all our computer purchases for 10 years now. He has always provided us with excellent pricing and support before, during, and after the sale. On the rare occasions we had problems he always worked to make it right. I look forward to working with David on future purchases for many more years. ©2015, Compugen Inc. All rights reserved.